Discussion in 'Contrails and Chemtrails' started by Mick West, May 26, 2014. 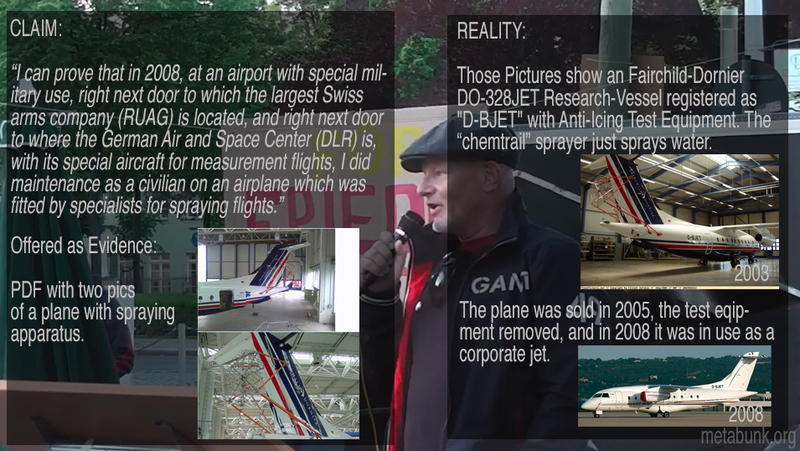 On May 12th, 2014, at a German Peace Demonstration in Dresden, a person who claimed to be a former aerospace engineer (later identified as "Jens") gave a brief talk, claiming to have have installed "chemtrail" spray equipment on planes. But his story fell apart after he presented his "evidence". The plane he claims to have worked on in 2008 was an 2003 icing test plane, retired in 2005. I am air and space engineers and have aircraft repaired and so on ( ... ) I have a plane equipped on the military Oberpfaffenhofen airport in cooperation with the German air and space center with a spray thing in the sky sprayed toxic substances from us . When I went with the evidence , the photos and all the trimmings to my Greens MPs in the civil office and said I : "Here . How it should look . I imagine each committee of inquiry available, " my boss is three days later come to my house and said," I have to dismiss you because large wheels are rotated from the top that I can not hold " . I get out of a job in aviation. (Applause) Everyone who would like to know what it looks like and how it is done , which can then come to me , I have everything here . I would only say this : When we were done gutted with the conversion of this flier , so we have the inside, all the tanks have installed , have the lines down , this spray have installed because we were told I was a civilian employee , under control of the military that the German aerospace center, makes practically as a test , yes, the plane flies in front, then flies which their particle measurement plane afterwards and measures particle density , output parameters and so on ... eventually want yes wissem how widespread the . And we were done and since then came the military and has instructed us to wear full protective suits and breathing masks , because the tanks have to be filled and the substances that come in there , aluminum sulfide , barium now what I know , are interspersed with nanoparticle large polymer compounds which are highly toxic to you, so now you have to wear protective suits. So much for that . Jens later "released" a more detailed text version of his speech, and six PDF documents that he said were evidence that his story was true. In fact the document demonstrate fairly clearly that his story holds very little water. I send you all today, in written form, the statements I made on Monday at the vigil, and the related documents I gathered together. I would be pleased if you published them on your site. Unfortunately, the video is titled "aircraft engineer" on YouTube. But that is not true, because I'm a technician! My field is the service and maintenance of airplanes, and I specialize in engines. I would also like to emphasize once again that neither I, nor work colleagues that I could ask, have ever found something during maintenance and repair work on civilian equipment (i.e. passenger and cargo aircraft ) that proves something is sprayed during flight from civilian machines via special equipment in and around the aircraft! This requires an extensive renovation project in advance, with the installation of special tanks, pipes, systems control, and sprayers. Each of these works would stand out on the flyer, and would be hard to hide. But I can prove that in 2008, at an airport with special military use, right next door to which the largest Swiss arms company (RUAG) is located, and right next door to where the German Air and Space Center (DLR) is, with its special aircraft for measurement flights, I did maintenance as a civilian on an airplane which was fitted by specialists for spraying flights. The plane was equipped with tanks in the interior, and at the rear a sprayer was fitted. 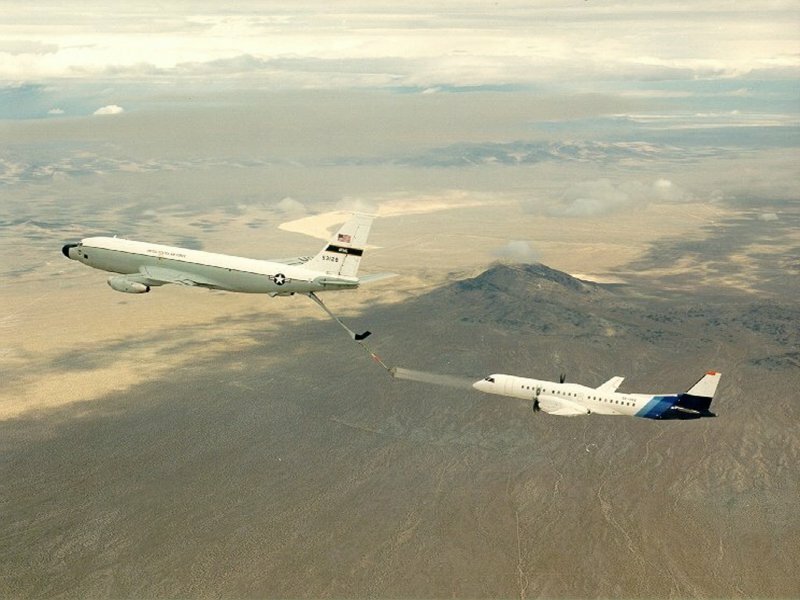 This was large in area, and could simulate different situations in order to measure the spreading of substances during the flight. This special aircraft was there to fly ahead and spray, so that the DLR aircraft behind it could perform measurements. When the built-in aircraft tanks were filled, those of us working on the machine were told by military personnel to wear special gloves and protective clothing, on the grounds that the substances that come into the tanks are toxic for humans, and also that they contain nanoparticles that can be absorbed through the skin and the respiratory tract into the body. Well then, I had not heard or read anything about chemtrails. But when I started to ask questions about all the toxins that are used in aviation, I also came to the subject of chemtrails and I suddenly realized what I had experienced at that time. After all, data must have been collected and evaluated, to ensure that the technical implementation and feasibility can be optimized based on the collected data. And all this is done at the military level, and we are told that everything is harmless and safe for humans. So, if measurements have already been carried out by the DLR on the spread of so-called "normal contrail cirrus," then all this leading edge technology could explain once and for all WHAT particles or substances are included in the atmosphere, and WHY! Because there are ice clouds caused by air traffic, and this spread is not new. Once I realized that the responsible authorities would not release any data or information on these issues, I went to the city office of the Green Party in my area, and asked for an investigation to be initiated, to find out what is happening above our heads. I left my name and telephone number, and hoped for a call. It never came, but three days later my boss came to my house, to tell me that he had to fire me, due to the turning of wheels far above, against which he was powerless. He told me that he had been told I would talk too much. So if there is nothing to hide from the people of this country, then let independent scientists finally hold a public inquiry into the substances in our atmosphere, and prove that no toxins are distributed over our heads, with the aid of aircraft, for whatever purpose! Because if they are spraying over us with toxic substances to prevent further warming of the planet, and want us to believe that it's safe for us? Sorry, but that is quackery, and no help for the planet. Note that in both photos there are identical strips of aluminum repair tape, or speed tape. 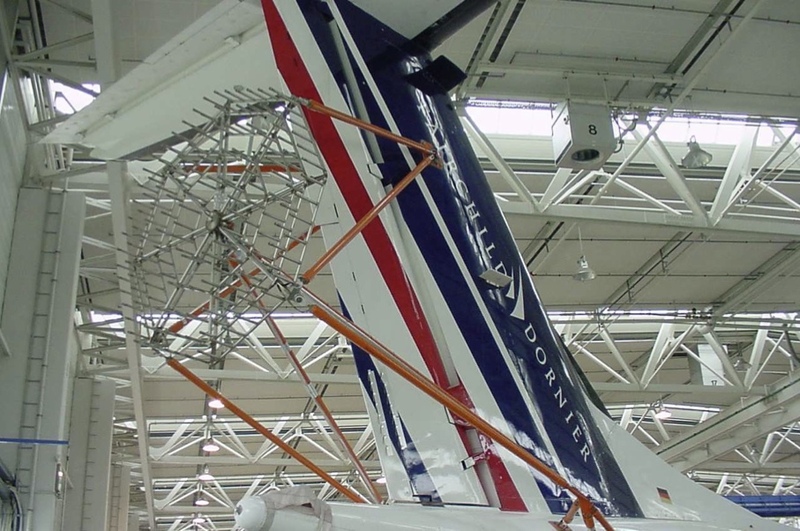 This type of repair is unique to individual planes, and so demonstrates that these photos in the PDF are of D-BJET. The supposed "chemtrail" plane was owned by Dornier in 2003, and sold to PrivateWings in 2005, and converted to a normal passenger jet. Hence it could not have been a plane he was working on in 2008. Here's what the plane looked like in 2005, and still looks like today. The second PDF is a listing for a job vacancy at DLR (a German aviation company) from 2013. Hence again is nothing to do with what he was doing in 2008. The job itself is simply measuring ice crystals in clouds and contrails. Something DLR has been doing for many years as part of broader research on climate. The next three PDFs are not evidence at all, and are simple random articles on the "Chemtrails" theory that were copied from the internet. "Uran" is about a barrel of depleted Uranium. "CIA" is just some old speculation on using cloud seeding as weapons, "Chemtrails" is just a collection of links about the chemtrails theory, and the final PDF is the text that is translated above. Thanks to Mick for picking up the main facts from the german source. Some short additions from the german Forum "Allmystery.de" that was used as Reference. 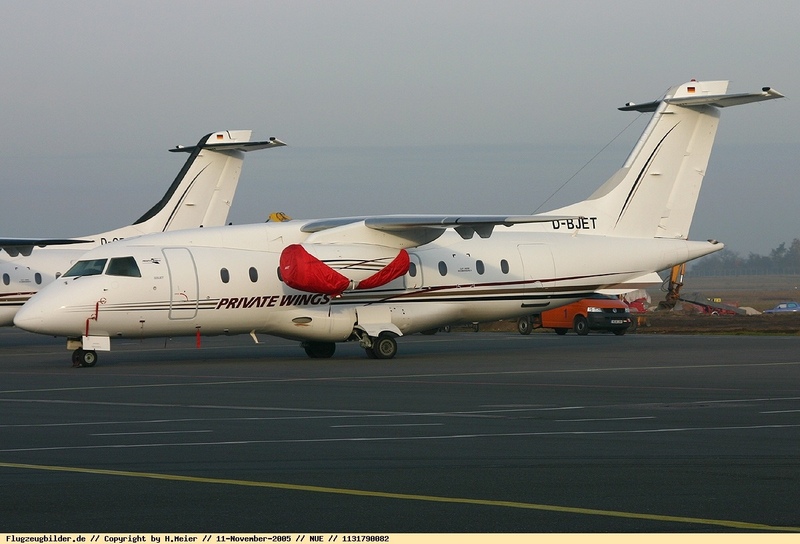 The Dornier 228 Ice Tanker (DIT, Fig. 1) is equipped with a spray array mounted behind the tail. The spray array has an octagonal shape, 1,60 m diameter and can be equipped with changing types of up to 61 spray nozzles..."
I cleaned up the translation of his written statement a bit, to reduce the "Yoda effect" that Google Translate sometimes has. I mention this because the ICAS PDF that FZG linked to describes as 328 (the icing target in this case) as a turboprop, so it's good to make the distinction for clarity. Thanks, I've incorporated that into the OP. Also added an infographic style debunking, for easy Facebook sharing. 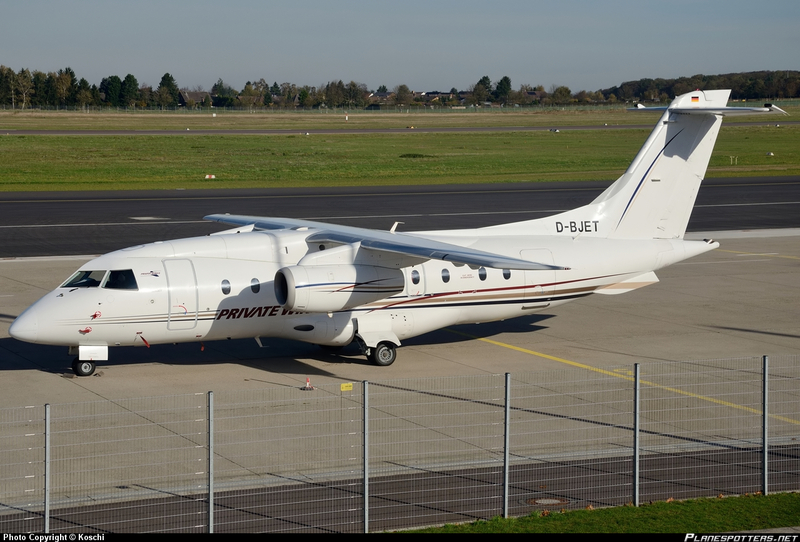 Those Pictures show an Fairchild-Dornier DO-328JET Research-Vessel registered as "D-BJET"
How do you know it's D-BJET? The registration number is not visible in the photos in the pdf. Because it looks exactly the same. That's what I thought. But it could be a different plane of the same type. I was trying to look at the details. What is this? Duct tape? Looks like aluminium tape, commonly used on aircraft for minor field repairs, among other uses. Thanks. Then it must be the same plane. On the other hand, it seems to me that the German guy never explicitly said that the photos in the pdf show the very plane he claims to have worked on. Maybe he just intended the photos as illustrations. Not comforting in what sense, that they made repairs to a multimillion dollar asset with "speed tape" instead of doing it the right way, and I'm assuming the right way would put the plane out of commission for quite a while, otherwise they wouldn't resort to tape. 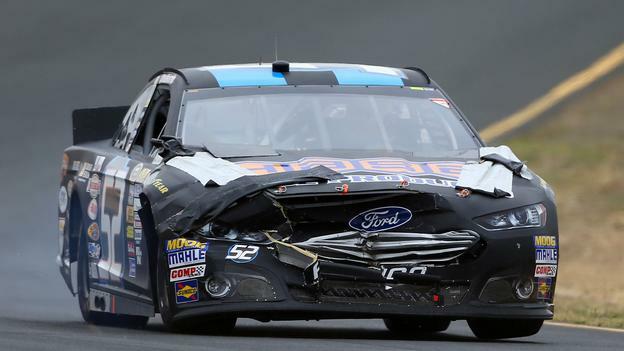 Have any accidents ever been the result of this "speed tape", or the result of putting a band aid on the damage instead of fixing it the right way? It's more to cover up paint that has maybe chipped away, to prevent corrosion until the jet has its scheduled depot maintenance or paint input. It is definitely not used to hold anything together. It works quite well actually. We can only see the rear without the engines, so theoretical it could be also a "normal" Do-328 with Props. 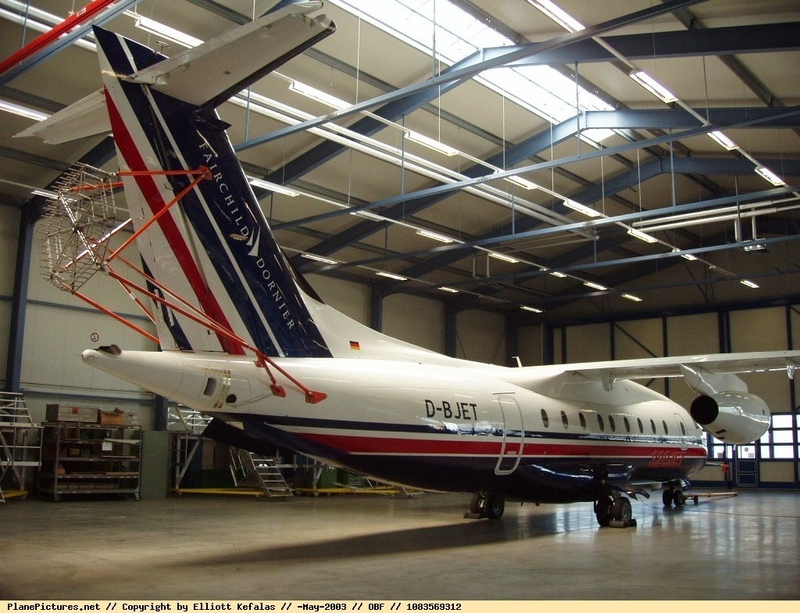 But there was only one Do-328 used by the manufacture Dornier in their company-paintings since 1998. It´s the DO-328Jet registrated as D-BJET . See the "Fairchild-Dornier"-Markings on the vertical stabilizer. It is definitely not used to hold anything together. It works quite well actually. I've seen (some mechanics jokingly refer to aluminium tape as "1,000 MPH tape") it used on leading edge slats, or other aluminium parts to cover very, very minor dings and dents, to smooth the airflow. But, of course, this is not a structural usage. I remember the myth busters built a plane out of duct tape once. Only 217 DO328 where bulid and only 110 of them are the JET-Version - it´s a rare Airplane. As this video appereared in Germany, I and some other german debunkers searched for it on the Planespotter-Pages and we found only this one. With this Spraying-Device and a visiblle registration. The main Research in the Opening Post was done in a german forum. By the way: The Company "Dornier" or (later) "Fairchild Dornier" doesn´t exist any more since 2005. So the Whistleblower must be lying if he claims he made this Photos 2008. I and some other german debunkers searched for it on the Planespotter-Pages and we found only this one. OK but that's not really convincing to me as it assumes that all planes have photographs from all years on those web sites. Which I strongly doubt. And these days of the internet, social media, cheap good quality cameras etc, and given the enthusiasm of aviation enthusiasts it is more unusual NOT to have heap a photographs of a commercial aircraft year in year out following every change in that planes livery and location. There are no photographs of D-BJET from 1999, 2000, 2001, 2002, and 2004. That's four consecutive years and another year. But the claim is the work was done in 2008, so not sure what a lack of photos for those years would indicate. Airplanes, when sold, can have the Registration numbers changed. This is common. (The Serial numbers, and Manufacturing numbers do NOT change, of course). It's as if YOU sell your car to someone, who lives in another country. The VIN of your car remains the same....only the license plate changes! Especially if a high-value airplane is "moved" from one country to another. Of course then, the registration will change, as it is registered by the new owner. We know the Registration marks for this jet WW - that's not the issue. I think @skephu is saying that because there are no photos from those years therefore there is an opportunity for it to be doing nefarious things? but that's a red herring - the work was supposedly done in 2008, but the equipment has been clearly identified as to purpose and date, so the claim is provably wrong regardless. Problem seems that many who are 'not' in the aviation field simply do not understand that airplanes are well-monitored...even more than automobiles. Maybe if you read the earlier posts in this thread you wouldn't have to invent hypothetical explanations of why I wrote what I wrote. The registration is not visible in the photos published by the German guy. So I asked how the plane was identified as D-BJET, and I got the answer that it was identified on the basis that D-BJET was the only similar-looking plane found among the photos on the planespotter web sites. But that method of identification relies on the assumption that the planespotter web sites are complete, and contain photos of all planes in the world from all years. But D-BJET itself demonstrates that the planespotter web sites are incomplete as D-BJET has no photographs from several years. So there could be another plane that looks similar, but has no photo on the web. Not hypothetical, logical. 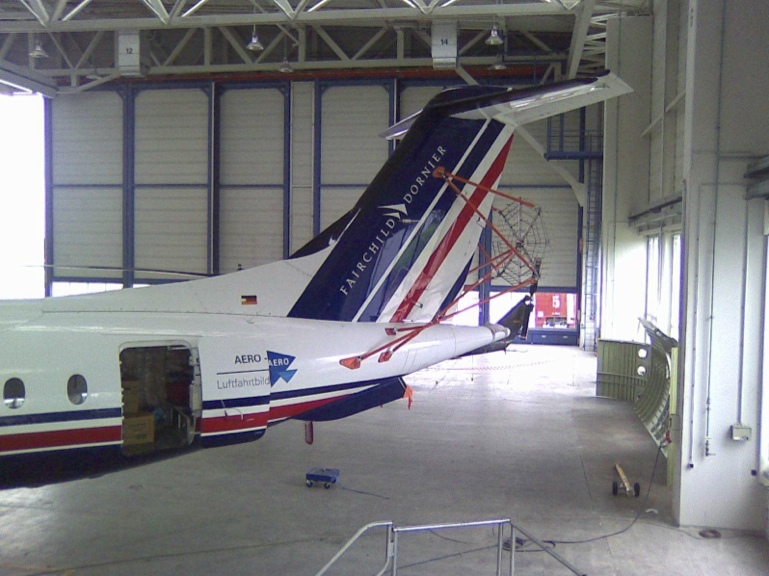 The livery shown is the corporate livery of the planes builders Fairchild-Dornier. As I said earlier when I laid out the planes service history, it was retained by the manufacturers for a period of 4 years as the development vehicle for the DO-328jet program before disposal into commercial service. Here is a full list of all DO-328's built, both the original turbo prop version and the jet variant of which D-BJET was the prototype. Now, by clicking on the airframe number you can get a full history of each plane built, a check through the list will show that D-BJET (airframe c/n3002) was the only one of the jet variants retained by Fairchild-Dornier, the rest were delivered straight into service. Now when a plane is delivered from new, it is NOT painted into the manufacturers livery for a delivery flight, it is normally painted into the customers livery at the factory, or delivered in a plain white livery. So with all planes accounted for, what plane was it? Are you suggesting that another DO-328jet was painted into Fairchild-Dornier corporate livery, in around 2008 for some nefarious purposes, right down to to the strip of tape on the tailplane being placed in exactly the same place? (we have already established that D-BJET was in Private Wings Flugcharter service by that date, when the 'whistleblower' claims to have done the work) If so which one and when, it is you making the claim that some plane other than D-BJET was in those colours, so to back up the claim you have to provide the evidence. And i'm still pretty sure that if you dig deep enough and look long enough the gaps in the photo history of D-BJET can be filled. Yes, even though in 2004 it would have been N328FG, as mentioned by Whitebeard, that is a fairly big gap. No there couldn't. The planespotter photo explanation is a red herring. It's a way of finding photos, but it's not an official source. All planes that are manufactured and sold are registered. You can easily search the OFFICIAL records for aircraft of a given model that have been registered to a given company, especially with a relatively rare plane like this. It is a fact that this was the ONLY aircraft of this model that was retained by Fairchild-Dornier. @Whitebeard My statement was that it is false to assume that all airplanes have photographs from all years on the planespotter web sites. It looks like you tried to claim the contrary, but you have failed to prove your point. In fact, as I looked through the list of DO-328s, I found a lot of planes without a single photograph over their entire lifetimes on the web. So no, not all planes are photographed every year and shown on the web. Where are those official records to be found? So no, not all planes are photographed every year and shown on the web. I'm not sure that was the claim, I thought it was just that planespotter sites are a useful resource and research tool to use. no I'm pretty sure skephu (in the posts I was replying to) was pointing out that there was a claim that here are photos of every jet every year - which is not true as he(?) has noted. Thus showing that absolutes are rarely useful in discussion as they can often be easily refuted! And as skephu has correctly pointed out the registration of the jet is not visible in the photos that accompany the claims. However it is also fairly obvious that he setup in the claims is the same as that for the icing rig from Fairchild-Dornier, and it is also true that Fairchild-Dornier did not exist in 2008 - having declared itself insolvent in 2002! so there are very good reasons to think that the photos doe show D-BJET, and the claims are BS! Here is a good place to start. 110 results for this aircraft type. I'd agree we don't have 100% coverage, especially if you go back to the 1990s and before, with no digital cameras. But do you actually think that it's at all likely that the plane in the OP was misidentified? That there might have been another identical plane in 2008, with the exact same livery (now out of date) and icing test equipment as D-BJET had in 2003? I think perhaps you are laboring a point that's not entirely relevant here. ...and as also mentioned in this thread Fairchild Dornier had ceased trading. Therefore he is either lying or a different plane was involved. So if it wasn't D-BJET what was it? Now your the one claiming there could be another DO-328jet around in Fairchild-Dornier livery, not me, so it's up to you to find the evidence for it, all I was doing was pointing in the direction that may help you find the evidence you need. I did say its very likely that there is a very comprehensive record of most planes over most of their careers* (and I stand by that), but I never claimed they would all be in the same place. To find them you will have to search every plane forum and its gallery, go through the facebook albums of plane spotters and plane spotting groups, watch a lot of youtube etc vids of take off and landings at various airports, the info is there, but you will have to dig for it.